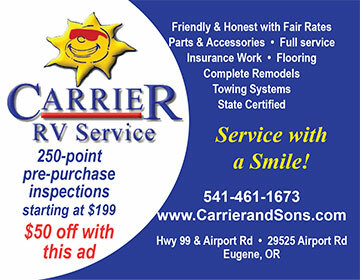 From a modest beginning in the fall of 1996, Carrier RV Service has grown to be one of the bright spots for RV Service in the Eugene, Oregon area. Tom and Teresa Carrier, the owners of Carrier RV Service, enjoy what they are doing and it shows in their daily interactions with customers. Tom and Teresa were both working in the service department of an RV dealership back in 1996. Their experience gave them a firsthand look at the need for fair, honest, and customer-oriented RV service. So, Tom, Teresa and their three sons took their savings and started Carrier RV Service. More than two decades later they continue to provide high quality, reliable, fair and customer-oriented service. Tom Carrier has been in the RV industry since 1980, working with several luxury coach manufacturers as well as three of the larger RV dealerships in the area. Tom has working knowledge of Allegro, Beaver, Country Coach, Fleetwood, Gulf Stream, Harney Coach, Monaco, Safari and many more. He also has nearly four decades of understanding all phases of RV repair and maintenance. Tom, Teresa and their employees find it easy to meet their customers’ expectations by always being honest and upfront with them. Carrier RV Service provides top-quality service, uses well-trained technicians and they always stand behind everything they do. Have you located that perfect RV to purchase? Be sure to do a pre-purchase inspection that could save you from excessive repair costs before you make that full investment. Carrier RV Service will do a thorough inspection of the RV and provide a complete list of all questionable items found during the check. A quote of all parts and labor to repair each item is also furnished to you. The pre-purchase inspection report gives you a look into the true condition of the RV. Armed with that information you can make a confident decision on whether to buy the RV, request repairs, bargain for a better price or not purchase that particular vehicle at all. It’s all up to you – and it starts with knowing what you are buying. More than 250 items are checked during the pre-purchase inspection of each RV.